The objective of this study was to determine the effects of conjugated linoleic acid (CLA) oil supplementation on the growth performance and lipid metabolism in geese and the fatty acid concentrations in their liver and muscle tissues. One hundred and ninety two one-day old geese were randomly assigned to one of four dietary treatments. The diet in Group A, the control, contained 2.5% soyabean oil, that in Group B 2.0% soyabean oil and 0.5% CLA, that in Group C 1.0% soybean oil and 1.5% CLA and that in Group D 2.5% CLA. The birds were fed for 56 days. No significant effects were observed in body weight and body weight gain between Groups B, C and the control, but these parameters were significantly lower in Group D compared to the control. The feed intake, feed conversion ratio (FCR) and abdominal fat percentage (AFP) were significantly lower in the groups receiving CLA in their diets compared with the control. Dietary CLA altered serum lipid concentrations by decreasing total cholesterol, triglyceride and low density lipoprotein-cholesterol concentrations, the atherogenic index and activity of lipoprotein lipase, and increased serum concentration of high density lipoprotein-cholesterol. The fatty acid composition of the liver and muscle tissues showed significant increases in the biologically active cis-9, trans-11 and trans-10, cis-12 CLA isomers in the geese fed increasing levels of CLA. The supplementation of CLA to the geese led to significant increases in saturated fatty acid concentrations and significant reductions in the monounsaturated fatty acid concentrations in liver and muscle tissues. The results clearly demonstrated that geese can successfully incorporate CLA in their liver and muscle tissues, thus producing a healthy food for humans. Conjugated linoleic acid (CLA) is a term used to describe positional and geometric isomers of linoleic acid (18:2n-6; LA). The two main naturally occurring isomers are cis-9, trans-11 and trans-10, cis-12. These compounds occur particularly in dairy products and ruminant meat, such as beef and lamb, but are present at lower concentrations in many foodstuffs (Chin et al., 1992; Pariza et al., 2001). In light of the above, the aim of the present study was to investigate the effects of graded dietary levels of CLA (0%, 0.5%, 1.5% and 2.5%) on growth performance, lipid metabolism and fatty acid composition in the liver, leg and breast tissues of geese. The trial was performed with the hypothesis that the supplementation of geese diets with CLA would produce more healthy geese products for human consumption. The experiment was carried out in an experimental animal house at the Qingdao Agricultural University, Shandong, China and lasted 56 days. A total of 192 one-day old Wulong geese with a mean initial body weight of 79 ± 1.13 g (± s.d.) was selected and randomly assigned to one of four dietary treatments. Each treatment consisted of four replicates of 12 geese. The geese were fed a maize-soyabean basal diet containing 2.5% oil (Table 1). The different treatments contained different proportions of soya oil and CLA. 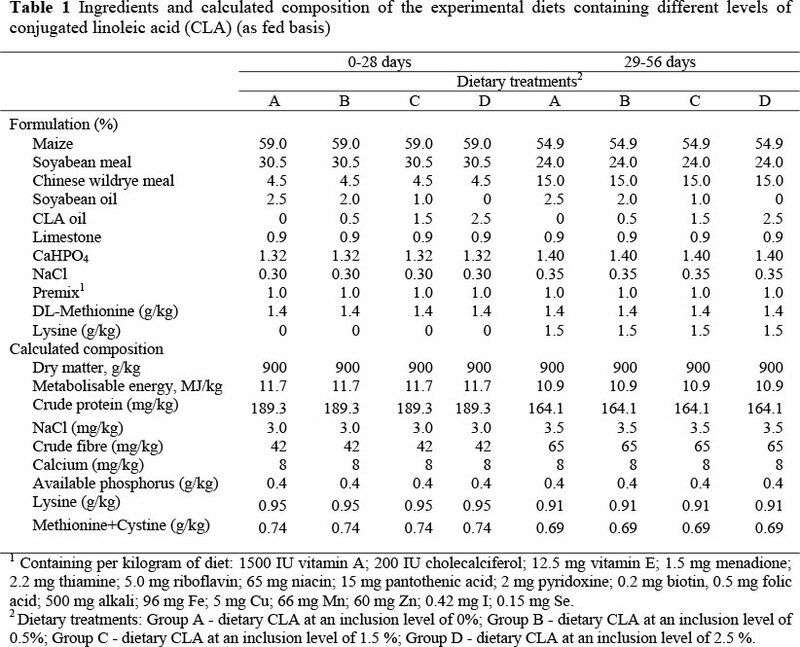 The control diet (Group A) contained 2.5% soya oil and 0% CLA, and in the other treatments CLA replaced the soya oil. 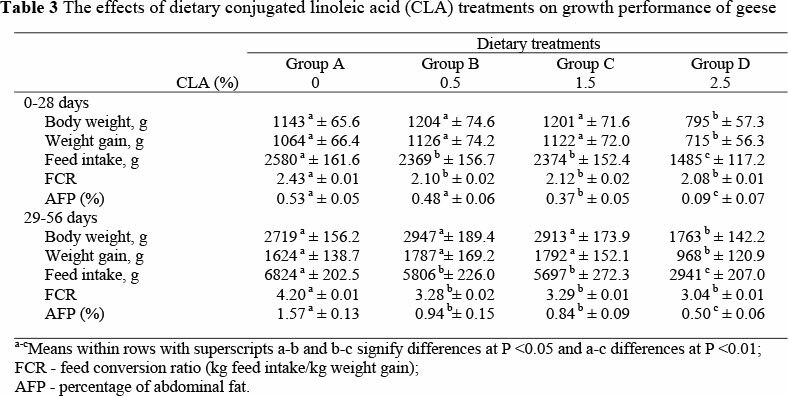 In Group B the diet contained 0.5% CLA, that in Group C 1.5% CLA and in Group D 2.5% CLA and no soya oil. The CLA contained 80% CLA free fatty acids mainly consisting of 36.7% cis 9, trans 11 and 39.5% trans 10, cis 12 isomers, and was purchased from Qingdao Aohai Biologic Limited Company, Shandong, China. The fatty acid profiles of the experimental diets are presented in Table 2. The geese were fed a starter diet until 28 d of age followed by a grower diet from 29 to 56 d. The diets were formulated according to the nutritional requirements for geese (P.R. the Act of Technical Specification for Wulong-geese Production; Serial Number: DB37/T503-2004, 2004) and were formulated to be isoenergetic, isolipidic and isonitrogeneous (Table 1). Ingredients were obtained from a local market in Qingdao Shandong, China. An antioxidant, butylated hydroxytoluene (BHT) was added to minimize oxidation of the fatty acids. Diet preparations were carried out at the experimental animal house. Standard management practices for growing geese were followed. The birds had free access to their feed and water, and immunoprophylaxis was applied. All experimental procedures were performed according to the Guide for Animal Care and Use of Laboratory Animals of the Institutional Animal Care and Use Committee of the university and the protocol was approved by the Animal Ethics Committee. Data on feed intake and body weights of the geese were collected weekly and mortalities were recorded daily. At the end of the feeding trial feed was withheld for 12 h whereafter three geese were randomly selected from each replicate, weighed, and blood samples were collected into heparinized syringes from each bird via their wing veins. Serum was obtained within 3 h of sampling after centrifugation at 1000 x g for 10 min and at 4 °C. Serum samples were frozen and stored at -80 °C pending analyses. After the collection of blood, all geese were killed by exsanguination and slaughtered immediately. The liver, leg and breast muscle samples were removed, frozen immediately in liquid nitrogen and stored in a freezer at -80 °C prior to fatty acid determinations. Thereafter abdominal fat was collected and weighed. For determination of serum total cholesterol (TC), LDL-C, high density lipoprotein-cholesterol (HDL-C), total triglyceride (TG) concentrations and lipoprotein lipase (LPL) activities the corresponding diagnostic kits (Nanjing Jiancheng Bioengineering Institute, Nanjing, P.R. China) were used according to the instructions of the manufacturer. The lipoproteins, LDL-C and HDL-C, were fractionated by a dual precipitation technique (Wilson & Spiger, 1973). After fractional precipitation, lipoprotein cholesterol was estimated. The atherogenic index (AI) was calculated as (TC-HDL-C)/HDL-C (Yang et al., 2006). A decreased value of AI showed a stronger lipid-lowering effect, as well as a high antiatherogenic potential. Total lipids were extracted according to the method of Folch et al. (1957) and lipid content determined gravimetrically as described previously (Kennedy et al., 2005). Fatty acid methyl esters (FAME) from diets and tissue total lipids were prepared by the acid-catalyzed transesterification of total lipid, following the method of Christie (1982), except that the reaction was performed at 80 °C for 3 h. Fatty acid methyl esters were extracted and purified by reaction with 4% HCl in methanol for 20 min at 60 °C. The FAME were separated and quantified by gas-liquid chromatography (Carlo Erba Vega 8160, Milan, Italy) using a 30 m x 0.32 mm i.d. capillary column (CP Wax 52CB, Chrompak, London, U.K.) and on-column injection. Hydrogen was used as carrier gas and temperature programming was from 50 °C to 150 °C at 40 °C/min and then to 230 °C at 2.0 °C/min. Methyl esters were identified and quantified as described previously (Kennedy et al., 2005). Individual fatty acid methyl esters were expressed as percentages of all peaks. Unless otherwise stated, all data are presented as means ± s.d. The effects of dietary treatments were determined by Student's t-test or one-way analysis of variance (ANOVA) followed, where appropriate, by the Tukey's comparison test (SAS, 2001). Percentage data and data which were identified as nonhomogeneous (Bartlett's test) were subjected to arcsine transformation before analysis. Significance was evaluated at the 0.05 level. The effect of dietary supplementation of CLA on body weight, weight gain, feed intake and feed conversion ratio (FCR) of the birds is presented in Table 3. Differences with respect to body weight and weight gain during the two growth phases of 0 - 28 and 29 - 56 d were significant (P <0.05) between Groups A and D, but not (P >0.05) between Groups A (the control), B and C. Group D exhibited the best FCR compared to the other groups (P <0.01), and the lowest (P <0.01) AFP compared with the control. Feed intake was lower (P <0.01) in Group D than in the other groups. Table 4 presents the effect of dietary CLA treatments on serum lipid biochemical variables in the geese. Treatments with graded levels of CLA supplementation brought about a decrease (P <0.05) in the TG levels and AI of the geese, and an increase (P <0.05) in the HDL-C levels in comparison with the control. The diets containing dietary CLA at inclusion levels of 0.5% and 1.5% reduced (P <0.05) the TC levels in serum, and at 1.5% and 2.5% CLA decreased (P <0.05) the serum LDL-C concentration in geese compared with birds in the unsupplemented control. Addition of different levels of CLA to the diet increased the activity of LPL. The fatty acid compositions of liver, leg and breast tissues are shown in Tables 5, 6 and 7, respectively. Supplementation of dietary CLA resulted in their deposition into lipids of the liver and muscle tissue, and an increase (P <0.01) in the biologically active cis-9, trans-11 and trans-10, cis-12 CLA isomers in CLA-fed geese compared to unsupplemented geese. 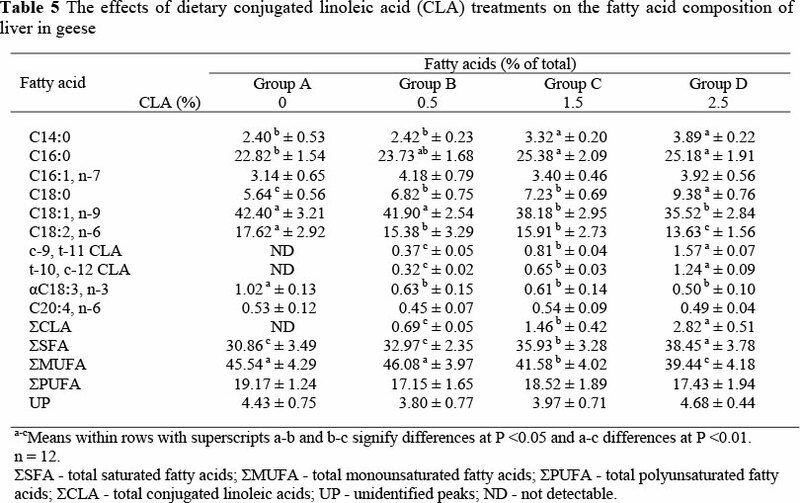 However, it was noteworthy that CLA was deposited to a greater extent in liver lipids than in lipids in breast and leg muscles, reaching 2.82%, 1.88 and 1.31% of total fatty acids, respectively, in geese fed 2.5% CLA. Dietary CLA increased (P <0.01) the saturated fatty acid (SFA) concentration and decreased (P <0.05) the total monounsaturated fatty acids (MUFA) concentration in liver, leg and breast tissues. It also decreased (P <0.05) the total polyunsaturated fatty acids (PUFA) concentrations in leg and breast tissues. 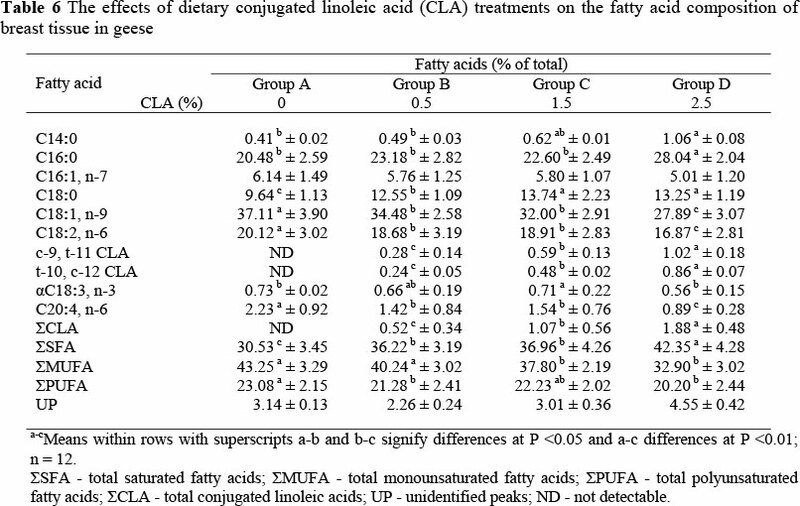 The palmitoleic, oleic, linoleic and linolenic acid concentrations tended to be lower (P <0.05) in CLA-fed animals than in animals not receiving CLA, while the concentrations of myristic, palmitic and stearic acids were higher (P <0.05). Conflicting results have been reported on the effect of CLA on growth and feed efficiency in different species (Thiel-Cooper et al., 2001; Wiegand et al., 2002; Dugan et al., 2004). In the present study increasing dietary CLA levels (0%, 0.5% and 1.5%) did not affect (P >0.05) body weight and body weight gain of geese, but their feed intake, FCR and AFP decreased (P <0.05) compared with that of the control. However, CLA can inhibit growth at high dietary levels (2.5%) of inclusion, which can be attributed to the sharp decrease in feed intake (P <0.01). It has been shown by Cao et al. (2007) that the relationship between weight loss and CLA taken as a supplements or when occurring naturally in foods could be more complex than initially thought. They indicated that the anorectic effects of CLA are mainly exerted on the arcuate nucleus (ARC). The Agouti-related protein (AgRP) concentration and neusopeptide Y (NPY) mRNA expression were decreased upon CLA treatment, indicating that the metabolism of this specific lipid within the lateral hypothalamic neurons exerts a negative feedback on food intake. Szymczyk et al. (2001) reported that in chicken there was a significant decrease (from 2.68% to 1.78%) in AFP when CLA levels in the diet increased from 0% to 1.5%. Sisk et al. (2001) reported that there was a dose-dependent effect of CLA in the regulation of body fat tissue in rats, so there would be an interference in the metabolism of fat and a reduction in body fat mass in rats if CLA was fed for an extensive period (Tsuboyama-Kasaoka et al., 2000). At the end of the present study, inclusion of CLA at different levels reduced (P <0.01) the AFP of geese from 1.57% to 0.5%. It is evident that CLA is especially important in the catabolism of abdominal fat. Supplementation of CLA did not affect the body weight of geese. This could suggest that there is not a reduction of body weight but anorectic effects that led to the decreased AFP. It has been shown that abnormally high serum levels of LDL-C and low serum levels of HDL-C are associated with an increased risk for atherosclerosis in rats (Yang et al., 2006). In the present study the serum lipid status of the CLA-fed geese showed decreased concentrations of serum TC, TG, and LDL-C, whereas the HDL-C concentration was increased compared with the control. The AI, defined as the ratio of TC/HDL-C and HDL-C, is believed to be an important risk factor of atherosclerosis. Our data clearly demonstrated that CLA supplementation leads to a decreased ratio compared with the unsupplemented control (P <0.05). Mounting evidence has suggested that LPL is essentially an antiatherogenic enzyme (Kastelein et al., 2000; Fan et al., 2001). In comparison with the control, the LPL activity in the serum of geese fed CLA in our study was found to increase (P <0.05), which may play a key role in the lowering of AI. Our study suggests that the decrease in serum lipid concentration might result, at least to some extent, from an increased LPL activity. LPL is a glycoprotein involved in the transformation of dietary lipids into sources of energy for peripheral tissues. It separates free fatty acids from TGs present in chylomicrons and very low density lipoproteins. On the other hand, the hydrolysis of TG-rich lipoproteins also releases apolipoproteins and phospholipids that are precursors of high density lipoproteins (HDL). High density lipoproteins are key components of reverse cholesterol transport, bringing cholesterol from peripheral cells to the liver, where it is excreted in the bile (Yang et al., 2006). As a result, an efficient LPL is associated with lower TG and LDL levels but higher HDL levels, and is therefore potentially atheroprotective (Brunzell, 1995). 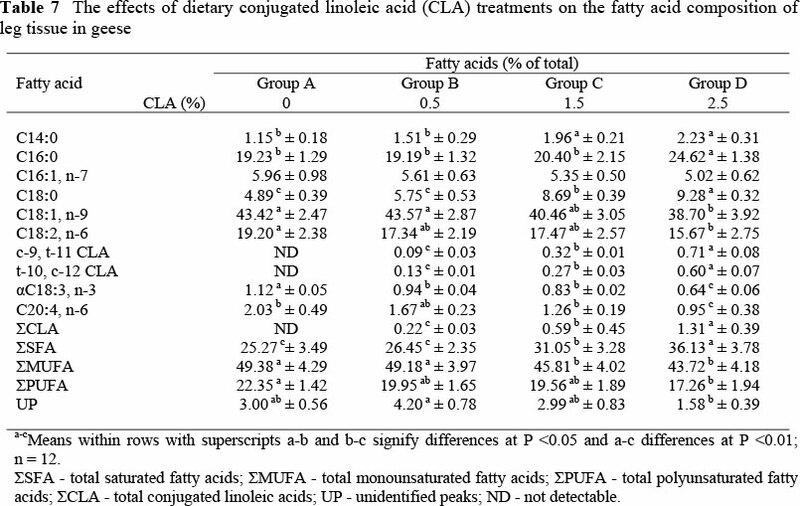 The changes in fatty acid profile in relation to CLA supplementation are consistent with those observed in studies of CLA supplementation in pigs (Joo et al., 2002; Ostrowska et al., 2003), pigeons (Aydin, 2005) and quails (Aydin & Cook, 2004). The lowered MUFA levels and increased SFA levels in CLA-fed animals are probably due to an inhibition of A9-desaturase by CLA, since other in vivo and in vitro studies have shown that CLA reduces A9-desaturase activity either by suppressing mRNA (Ntambi & Miyazaki, 2004) or by reducing the activity of the enzyme (Choi et al., 2000; Choi et al., 2001) thereby reducing MUFA levels. Corino et al. (2007) reported a lowered A9-desaturase in CLA-fed pigs. We found that dietary supplementation of CLA to geese decreased feed intake, FCR and AFP, and also modified lipid content and fatty acid composition of fat in the body. The deposition of biologically active cis-9, trans-11 CLA and trans-10, cis-12 CLA isomers in CLA-fed geese suggests that the nutritional quality of geese products for human consumption is improved. The research was supported by the National "fifteen" science and technology key task (Serial Number: 2004BA514A09-3) and agricultural fine breed industrialization of Shandong province, China.